It was a statement which perfectly illustrates the enigma of Arafat, negotiator of complex peace agreements or killer of innocents; a charismatic leader of his people commanding international acclaim, or a ruthless and corrupt demagogue. The ultimate issue, however, continuously assessed and debated by all observers of his leadership, was whether he was genuinely interested in creating a Palestinian state living in peace with Israel, or only in Israel’s eventual destruction. It is generally accepted that Muhammad Abdul Raouf Arafat Al-Qudwa Al-Husseini was born in 1929 in Cairo, although according to some of the varied accounts of his life he was born in Jerusalem or in Gaza or in France. He was the sixth of the seven children of a Palestinian textile merchant, and his mother came from the prominent Palestinian Al-Husseini family, related to Haj Amin Al-Husseini, the Mufti of Jerusalem who led the Arab revolt in the 1930’s. When he was four years old, his mother died, and according to the various accounts he was either sent away to live with his uncle, or he went with his father to live with his family, in a house in the Old City of Jerusalem, near to the Al Aqsa Mosque and the Temple Mount. He returned to Cairo four years later when his father re-married, and he was left in the care of an elder sister after his father re-married a second time. When his father died some years later, he did not attend his funeral. He then studied engineering at Cairo University, where he joined the Muslim Brotherhood and became President of the Union of Palestinian Students, holding that position from 1952 to 1956. It was at a student conference in communist Prague in1956 that he first dramatically appeared in a Keffiyeh, the traditional chequered head-dress, draped in the shape of Palestine, that became his trademark. As a graduate engineer Arafat moved to Kuwait, where he eventually established himself as a successful contractor. 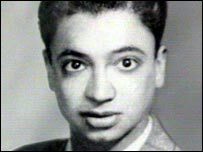 In 1959, he and his friend Khalil al-Wazir began publishing a magazine “Our Palestine”, and then formed a five-man underground cell which adopted the name Fatah , an acronym for “Palestine Liberation Movement”, with the initials reversed to form the word “victory”(rather than “death” if not reversed). Khalil al-Wazir was later to become the “military” leader of Fatah, and known as “Abu Jihad”. The title of the organization included the word “Palestine” rather than “Palestinian”, since it was seen as a pan-Arab organization dedicated to the liberation of Palestine, rather than a Palestinian movement, and its leadership was appointed by the Arab League. The Fatah group grew with finances raised from expatriate Palestinians in Kuwait, and on 1 January 1965 it made its first cross-border attack into Israel from Syria, in an unsuccessful attempt to blow up an Israeli water pumping station. In the next two years Fatah became known as an active Fedayeen (“Commando”) group, attacking civilian targets in Israel from bases in Syria and the West Bank. Then, after the 1967 war, it is said that Arafat made his escape across the Jordan River disguised as a woman carrying her baby. After the war, with the West Bank under the control of Israel, the inhabitants were generally reluctant to assist the Fedayeen, and hundreds of Fatah members were captured. Nevertheless Fatah made its name in March 1968, when it engaged in a full-scale battle with an Israeli force at the city of Karameh in Jordan, and 150 Palestinians and 29 Israelis were killed. The story of the encounter was inflated into a great victory. The battle was reported in Time magazine, and Arafat’s face appeared on the front cover. The Palestinians had found a hero. In May 1968 a Palestinian National Conference was held in Cairo. Fatah joined the PLO and Arafat was elected as its Chairman. The PLO was now organised as an umbrella group for the various para-military groups, which were represented on the Executive of the Organisation. Some were sponsored by different Arab Governments, including As Saiqa, affiliated with the Syrian Ba’ath Party, and the Arab Liberation Front, sponsored by the Iraqi Ba’ath Party. Others, such as the Popular Front for the Liberation of Palestine (PFLP), under George Habash, and the Democratic PFLP under Naif Hawatmeh, represented different Marxist approaches. The Organisation comprised an Executive, with members representing the constituent para-military groups, and a more broadly based Palestinian National Council, which assembled for occasional conferences. Article 6: The Jews who had normally resided in Palestine until the beginning of the Zionist invasions  will be considered Palestinians. – 22 November 1968 Bomb at Jerusalem market kills 14, including two Arabs. – 6 March 1969 Bomb at Hebrew University injures 28 students. – 13 February 1970 47 killed when Swissair plane blown up. – 22 May 1970 Eight children killed when school bus shelled. – 10 May 1972 Japanese “Red army” kill 27 Christian pilgrims at Lod airport. – 5 September 1972 11 Israeli athletes murdered at the Olympic Games in Munich. – 29 October 1972 Lufthansa plane hijacked. Munich killers released by Germany. – 11 April 1974 PFLP machine-guns 18 men, women and children in an apartment house near Lebanese border. 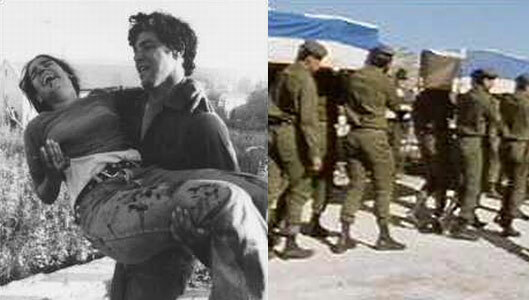 – 15 May 1974 PFLP invades a school at Ma’alot in Northern Israel, killing 20 children. By 1969 the PLO had established a powerful presence in Jordan, carrying weapons and collecting its own taxes, and operating in effect as a self-governing entity beyond the control of the Jordanian government. On 6 September 1970, the PLO hi-jacked four international airliners on the same day, and three of them were blown up at a desert airstrip in Jordan. 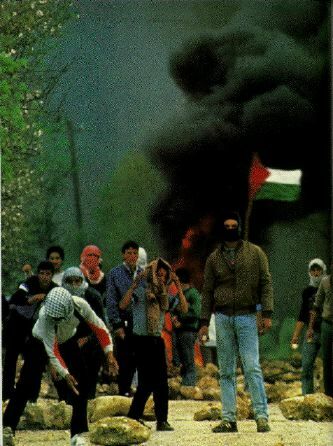 The boundaries of anarchy had been crossed, and King Hussein decided that the time had come to launch his forces against the PLO centres in the refugee camps. Syrian tanks crossed the Jordanian border to support the PLO forces, Israel mobilised its army and American warships appeared in the eastern Mediterranean. A ten-day war ensued in which the Syrian force was turned back by the Jordanians, and thousands of Palestinians were killed in the fighting. The PLO power in Jordan was effectively broken. The events were described by the Palestinians as “Black September”, and this became the name adopted by the terrorist group which killed the Israeli athletes at Munich. After 1970 the PLO moved its bases to South Lebanon, where it established a similar “State within a State” and carried out regular attacks on northern Israel. The Soviet Union supplied an immense stockpile of arms, and also trained PLO personnel in Russia. Members of terrorist groups from Japan, Germany, Ireland and Italy in turn received training by the PLO in South Lebanon, which became a centre for the growing international terrorist network. Unlike Jordan the Lebanese government was powerless to resist. After the Israeli athletes were kidnapped and then killed at the Olympic village in Munich, Golda Meir responded with an international operation by Israeli agents to track down and kill the leaders who had been responsible. Arafat’s response to the public outrage was to publicly dissociate the PLO from the Olympic attack, and to close down the Black September group. International revulsion against random hijackings and worldwide bombings now compelled Arafat to announce that the PLO would refrain from acts of violence outside Israel and the Territories. The first step in gaining legitimacy on the international stage took place in November 1973 at an Arab Summit Conference at Algiers. The Arab leaders, including King Hussein of Jordan, unanimously recognised the PLO as the “sole representative of the Palestinian people”. 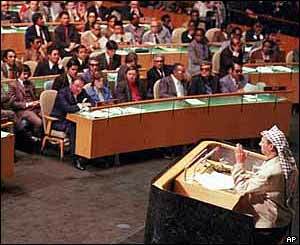 Then came the triumphant moment for Arafat and the PLO, as the group of non-aligned nations at the UN combined with the nations of the Soviet bloc to promote the Palestinian cause, and on 13 November 1974, Arafat was invited to address the United Nations General Assembly. 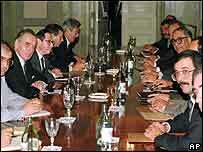 On 22 November the PLO gained a special status as an observer at all United Nations meetings. Matters became worse for Israel at the UN as the automatic majority of Soviet bloc and “non-aligned” states turned the organisation into a forum for a continuing campaign of anti-Israel propaganda. In November 1975 a resolution drafted by the Soviet Union, which equated “Zionism” with “Racism”, was passed by the General Assembly. The resolution remained on the United Nations record until Australia joined with other sponsors to present a formal revocation motion which was passed in 1991. In 1978 Israel briefly entered South Lebanon to attack the PLO bases. A full invasion followed in 1982 after the attempted murder of the Israeli ambassador in London left him paralysed. When the PLO retreated into a heavily populated area in West Beirut, Defense Minister Ariel Sharon ordered Israeli troops to follow with artillery fire, causing civilian casualties and heavy damage to buildings, but Arafat personally escaped injury. On 12 August 1982, Arafat agreed that the PLO would leave Lebanon. A truce was arranged, with the European Union guaranteeing safe passage to Tunisia and a multi-national force including 1800 US marines arrived in Beirut. The PLO leadership and some of the armed troops were evacuated from Beirut in a ceremony full of bravado with rifles fired in the air. It seemed that the threat to Israel posed by the PLO under Arafat’s leadership was finally over. A year later Arafat returned to Tripoli in Lebanon, and was expelled again, this time by a rebellion within Fatah fomented by agents of the Syrians. In 1985 Israel bombed the PLO’s Tunis headquarters, only to miss Arafat, who was “out jogging”. The spontaneous Palestinian uprising of 1987 had little connection with the PLO. However it did change the political equation on the ground. In September 1988 King Hussein of Jordan announced that he no longer sought sovereignty over the “West Bank”. Palestinian representation in the Jordanian Majlis (Parliament) would cease, as would Jordanian payment of public servants in the West bank area. It was the end of any prospect of a peace settlement on the basis of the “Jordanian option” proposed by Israel and Egypt in the first Part of the Camp David Accords. Arafat saw the opportunity for a new initiative. On 15 November 1988 the Palestinian National Council, meeting at Algiers, proclaimed an independent state of Palestine with a government-in-exile but without defining any boundaries. It also adopted a resolution calling for an international conference on the basis of Resolutions 242 and 338 and “all other UN resolutions”, and it renounced terrorism outside Israel. One month later, at a press conference at Geneva, Arafat publicly recognised “for the record” the right of all nations in region, “including the State of Palestine and Israel”, to live in peace. He also condemned all forms of terrorism including “state terrorism”, but not “resistance”. As pre-arranged, the US then authorised its ambassador in Tunisia to open discussions with the PLO. The other event which fundamentally changed the political equation was the overwhelming US victory in the First Gulf War against Iraq in 1990, which conclusively demonstrated the impotence of the Soviet Union in the region. It was an event which was also distinguished by a gross error of judgment by Arafat as he committed the PLO to a public demonstration of support for Saddam Hussein. In 1991 the United States was now in a position to call a Peace Conference at Madrid, at which Arab nations and Palestinian representatives took the significant step of meeting directly with Israeli representatives for the first time. Arafat’s position as a non-participant was crucial. Israel officially refused to speak to the PLO, and other Palestinians could not attend without Arafat’s consent, and were certainly unable to negotiate any agreement without the concurrence of the PLO as “sole legitimate representative of the Palestinian people.” Nevertheless Arafat tacitly agreed to the attendance of a joint Jordanian-Palestinian delegation, and the conference proceeded with an inconclusive speechmaking program. Meanwhile, Arafat sent a message through two Norwegian peace activists to Yossi Beilin, the dovish Deputy Foreign Minister in Yitzchak Rabin’s new government, hinting at the possibility of a breakthrough. Secret negotiations took place between Israeli and PLO representatives at Oslo in Norway, with the assistance of the Norwegian Foreign Minister. After months of negotiation the terms of a highly complex agreement were put together. Arafat wrote a letter to Rabin, in which he formally recognised Israel and renounced terrorism, and the way was open for the historic document known as the Oslo Accords to be signed at Washington on 13 September 1993. The signing was followed by a ceremony on the White House lawn, including Yitzchak Rabin’s conspicuously reluctant handshake with Yasser Arafat in the presence of US President Bill Clinton. In 1994 the Accords were implemented by the Cairo Agreement which made the detailed provisions for the Palestinian Authority and defined its jurisdiction. The effect of the agreement was that Arafat was now installed as Ra’is of the self-governing Authority, a word alternatively translated as “Chairman” or “President” by the two sides. The public signing had its typical moment of high public drama, with Arafat throwing down his pen and refusing to sign until President Mubarak of Egypt went outside and persuaded him to return. A few days later Arafat announced that the Palestinians would “continue their Jihad until they…liberated Jerusalem”. In theory the stage was now set for the negotiation of a “final status agreement” under which borders would be determined; controversial questions such as Settlements, the status of Jerusalem and the future of the Palestinian refugees would be resolved, and a peace concluded. The reality was that Arafat and successive Israeli governments haggled interminably over two central issues. The Palestinians demanded an acceleration of the process of “withdrawal from populated areas” which began with Jericho and Gaza, and soon extended to the major West Bank cities. Arafat’s demands became part of a verbal “war of percentages” as the portion of the area over which the Palestinian authority had exclusive jurisdiction was slowly increased, and not at a pace which satisfied the Palestinians. On the other hand the violence against Israeli civilians, which Arafat’s new government was supposed to control, increased from day to day, and Israel responded to Arafat’s demands for increased troop withdrawals with its own demands for “security co-operation”. Nevertheless Prime Minister Rabin still adopted the view that the “enemies of peace” should not be allowed to frustrate the peace. After the assassination of Rabin and the election of Binyamin Netanyahu, the new Likud Prime Minister simply refused to speak to Arafat at all as long as the terrorist attacks continued. The official term was “reciprocity”. Israel would negotiate further troop withdrawals when the Palestinian authority complied with its obligation to co-operate in eliminating the terrorist organisations. Then the opening of an exit to enable a tunnel next to the Temple Mount in Jerusalem to be accessed by tourists precipitated an outbreak of violence which Arafat did nothing to calm. Accusations that the tunnel would undermine the El Aqsa mosque led to riots throughout the Territories, including one episode in which Palestinian police opened fire on Israeli soldiers. Fifty-six Palestinians and fifteen Israeli soldiers were killed. Eventually the policy of not speaking to Arafat simply could not be sustained under the pressure of the continuing crises, particularly in Hebron, the Arab city on the West Bank where the tombs of the Hebrew patriarchs Abraham, Isaac and Jacob are situated, and which is also the home to two groups of Jewish religious settlers. On 17 January 1997, the Hebron agreement was concluded, and 80% of the city came under the jurisdiction of the Palestinian Authority. Arafat continued to maintain his personal relevance as a negotiator by officially accepting the principle of “reciprocity” even while the violence continued. In 1998, at a summit meeting between Arafat, Netanyahu and Clinton at the Wye Plantation near Washington, a Memorandum was signed with public ceremony. It providing for a step-by-step withdrawal of Israel forces from the West Bank, in parallel with steps for security co-operation by the PA, to be verified by CIA representatives. The reality was that nothing changed on the ground, and Arafat decided to introduce a new theme into the conversation – a demand that an independent State of Palestine should come into existence by a deadline of 17 September 2000, which was the target date for conclusion of a “final status agreement” contemplated by the Oslo Accords. On 18 May 1999 Labour candidate Ehud Barak overwhelmingly defeated Netanyahu in the election for PM, on a peace platform. When his new government was formed he immediately announced his intention to meet Arafat’s deadline. A timetable was set for a framework agreement with the Palestinian Authority to be reached by 1 July 2000, and a “final status agreement” by 17 September 2000. A summit meeting took place between Clinton, Arafat and Barak at the presidential retreat at Camp David, the site of the peace agreement between Israel and Egypt mediated by President Carter in 1978. For two weeks, from 10 to 25 July 2000, the effort was made to reach an agreement to create a Palestinian state living in peace alongside Israel. Arafat apparently made no counter-offer on the territorial issues. He demanded full Palestinian sovereignty over the Temple Mount, and recognition that all Palestinian refugees and their descendants, numbering some four and a half million people, should have a right to return into Israel itself, rather than to the Palestinian state alone. It was not a new position, and from the Israeli viewpoint, it was seen as a continued rejection of any “two peoples – two states” solution to the conflict, and in effect a call for the end of Israel as a Jewish state. When the conference did end in failure, Arafat returned to a triumphant homecoming in the Territories, hoisted on the shoulders of a cheering crowd and praised for standing up to Barak and Clinton. Assigning the blame for failure of Camp David II (and the subsequent talks at Taba) is critical for any assessment of the character of Yasser Arafat as a “partner for peace”. Most Israelis expected that Arafat’s categorical rejection of the Clinton proposals, which went well beyond the Israeli consensus, would result in a fresh international appreciation of the difficulties which Israel faced. However the effect on world opinion was not so clear-cut. “In important ways, Jerusalem is bigger than Palestine for many Arabs and Muslims, and had Arafat been perceived to have given away Jerusalem, he would not have been able to sell the deal – or contain the opposition. On 28 September 2000, Ariel Sharon, as leader of the opposition Likud party, made a formal visit to the Temple Mount, to assert the Jewish right of access to the area . The next day violent riots broke out in Jerusalem and the Territories, and for two days only, in some Israeli Arab towns and villages. At first the uprising was blamed entirely on the Sharon visit, but Palestinian leaders later acknowledged that the underlying cause lay in the claims asserted by the Palestinians at Camp David II. It became known as the “El Aqsa Intifada” both in recollection of the 1988 uprising, and as a call for Palestinian sovereignty over the Temple Mount where the Al Aqsa mosque is situated. The El Aqsa Intifada developed into a pattern of suicide bombings, at first organised by Islamic extremist groups, and then also by secular groups, including the “Al Aqsa Brigade” affiliated with Fatah and associated indirectly with Arafat himself. Hundreds of Israelis were killed and gruesomely injured at cafés and shopping malls, at bus stations and on buses. This was in addition to mortar attacks from Gaza into Israel; random shootings at Israeli cars, and attacks and killings throughout the Territories. The new outbreak of violence raised the usual unanswered questions about the role of Arafat. Did he actively encourage the uprising? Did he or could he have done anything to prevent it? The particular issue at this time was whether the Palestinian Authority under Arafat was prepared to engage in “security co-operation” with Israel to bring the attacks to an end. In fact the Palestinian Authority did arrest some of the perpetrators as requested by Israel, only to release them later under what was described as a “revolving door policy”. At the same time the Palestinian security forces jailed and executed those whom they described as “collaborators” with Israel. On 6 February 2001 Ariel Sharon, the leader of the Likud party, defeated Barak in the election for Prime Minister by a majority of 62.5%. In response to the crisis situation, he established a government of national unity and appointed Shimon Peres of the Labour party as Foreign Minister. Sharon announced a policy of no negotiations until the violence ceased. On 17 October 2001, Rehavam Ze’evi, the Israeli Minister of Tourism, was killed outside his hotel room. The Popular Front for the Liberation of Palestine claimed credit, and the leaders of the group took refuge at Arafat’s offices in the PA compound in Ramallah. Israeli troops moved into the West Bank and blockaded Arafat in his offices, allowing him to leave only when a compromise was reached and the PFLP leaders in the compound were placed in international custody. In March 2002, at a Passover night dinner (“Seder”) at a seaside hotel a suicide bomber killed 19 participants and injured over 130. The next day PM Sharon declared Arafat an “enemy” and announced that he would be “isolated”. Israel troops entered the West Bank in force, and army reserves were called up. At the PA government compound at Ramallah, Arafat was confined to two rooms. Large quantities of arms stored beneath the PA headquarters were also seized, as well as documents evidencing Arafat’s personal approval for the financing of terrorist attacks. By now the international community was convinced that Yasser Arafat was no “partner for peace”. In September 2002, when the “Quartet”, comprising the USA, the EU, Russia and the UN, announced their “roadmap” peace plan, they envisaged that a new Palestinian cabinet would be appointed, with an “empowered Prime Minister”, and an “empowered Interior Minister” controlling the security organisations, with the unstated implication that Arafat would step aside from actual control. Eventually, after the initial success of the US-led coalition in Iraq in March 2003, Mahmoud Abbas (known as “Abu Mazen”), who had played a leading role in negotiating the Oslo Accords, was appointed Prime Minister, in a power-sharing arrangement with Yasser Arafat as President. By September 2003 Abbas had resigned, unable to cope with Israel’s demand that he “dismantle” the extremist organisations, and frustrated by Arafat’s refusal to relinquish control over the security services or to co-operate in his proposed financial transparency reforms. In October 1994 Arafat became seriously ill with a disease which was never fully explained, despite daily medical bulletins from his Paris sickbed. Speculation varied from AIDS to poisoning, with both views officially denied. He died on 11 November 2004 at the age of 75. A formal funeral ceremony for international dignitaries took place in Cairo. It was followed by a burial next to the PA government compound at Ramallah, with wildly chaotic scenes as the massive crowd of mourners passed the coffin from hand to hand above their heads. Arafat was survived by his widow Suha Arafat, who married him in 1990, when she was aged 27, in a secret ceremony in the then PLO headquarters in Tunis, and their daughter Zahwa was born in 1995. Suha and her daughter apparently lived in Paris after the outbreak of the Al Aqsa Intifada in September 2000, receiving a reported allowance of $US100,000 a month. “Sources close to the Palestinian leadership said a bitter fight had broken out over who should control the ailing leader’s fortune estimated to be between $4.2 billion and $6.5 billion. 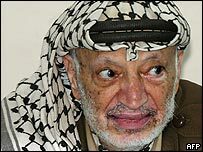 As Arafat lay on his deathbed in Paris, the Palestinian leadership visited him and had financial discussions with Suha. The outcome of those discussions was not made public. One theory was that she agreed to disclose the whereabouts of Arafat’s bank accounts in exchange for a guaranteed income. When Arafat died it was widely expected that a new opportunity for peace would arise. However the reality was that after 2004 a moderate level of calm was restored not as the result of any political sea-change, but rather as the physical result of the construction of the controversial security barrier. Mahmoud Abbas, everyone’s hope as the newly elected President, did not in fact succeed in uniting the Palestinian people in any commitment to peace or any determination to overcome extremism and corruption, and was himself effectively replaced by an uncompromising Hamas government. Certainly the wily, brilliant, charismatic, ruthless Arafat, complete with his rousing militancy on the one hand and his ability to hint at an elusive prospect of peace on the other, followed one path which was capable of uniting the restive Palestinian constituency. Whether a new leader can arise in the foreseeable future who will be capable of setting the Palestinian people on a new path towards peace and prosperity is another question.